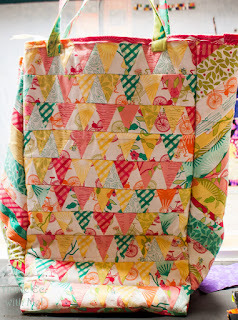 If you saw the Moda Acreage blog tour last week you saw the insulated bag I made for groceries. I used it for the next shopping trip and decided there were a few things I wanted to change. The bag did fine keeping the groceries cold on the trip home but I worried about a few things on the bag holding up over time. So I remade the insulated grocery bag to last longer, look better, and make me happier. Are you ready to make your own insulated bag? 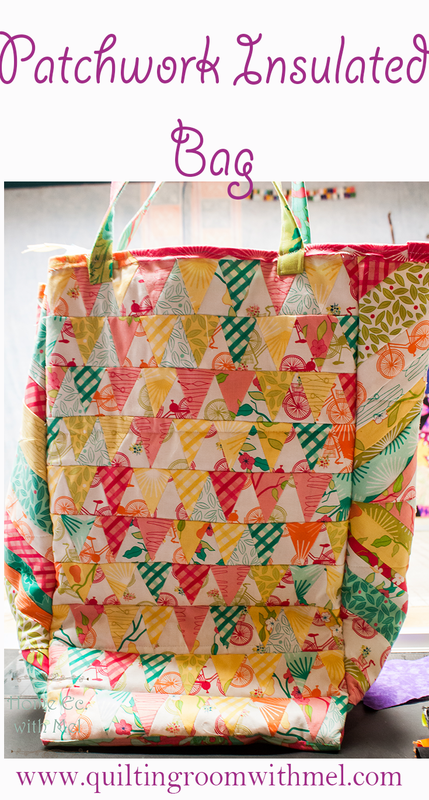 This bag can be as difficult or as easy as you want it to be with your patchwork. I still adore this fabric and can't wait for it to hit shops in September. Someone commented on the fabric post that they would like to make a top out of the fabric. I hadn't thought of that but I've already started thinking about which fabrics I want a blouse from. The ten panels we need to construct the bag can be solid pieces of fabric or patchwork panels of your choice. I adore triangles so I used those for the front and back of my bag. 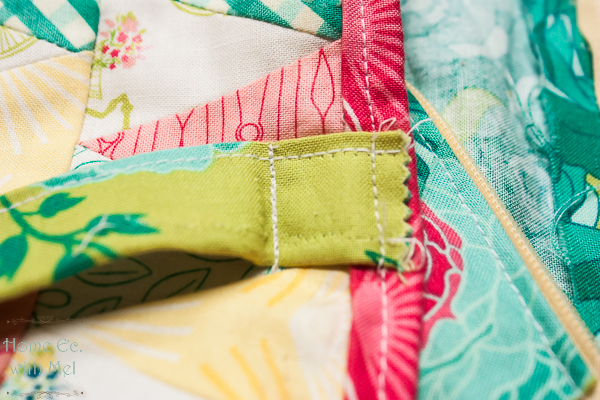 Triangles are easy to sew together as long as you have a good template. I use a Star Maker 8 to cut mine because that's what I have. There are other options for 30 degree triangles out there that would be easier for newer quilters. My template keeps the tips on so I have to make sure they hang off each end correctly and then trim them all off when I'm done. I started with 2 3/4" strips to cut my triangles out and each 13x18 panel has around 110 triangles. Bigger triangles sew up quicker but I was using scrap fabric so I went with the size I had. The other two 13x18 panels were made by sewing bigger pieces I had that were already 13" wide and sewed them together to make them 18" long. Simple because it's the inside of the bag and most are never going to see it. The six panels 9x13 are the sides and the bottom. The bottom is scrappy too. I sewed three strips together to get my size. The sides are string blocks. The inside of those three panels were made just like the inside panels above. Once you have your panels made it's time to make our bag. We are going to construct this bag a little differently than how bags are normally constructed. Start by sewing the bottom to the sides for the outside and the inside so you have one long piece. Now you should have an outside, an inside, two outside sides, and two inside sides. We start by sandwiching all those panels we just made. But the Insul-Fleece is pretty thick so we are going to leave a 1/4" around the edge. You want the shiny side facing the inside of the bag. You don't need to do a lot of quilting. We just want it to hold while we construct the rest of the bag. I just did a couple seams of stitch in the ditch. Do this to the front, back, sides, and bottom. Here's where the odd part of our construction if you're not familiar with garment sewing. We are going to sew our bag wrong sides together. Our seams will end up on the outside of our bag but just roll with me on this. With WRONG sides together, we are going to sew the sides onto the main bag sandwich with a 1/2" seam allowance. You sew the two long sides first and then you sew the bottom. When you sew the long side stop 1/2" from the bottom, then sew the bottom close. Do this to both sides. Originally I left it like this and bound off the raw edges. It looked fine but when I got the bag loaded I worried about the seams. So I took the binding off, with the help of the kitty, and decided to go with French seams. 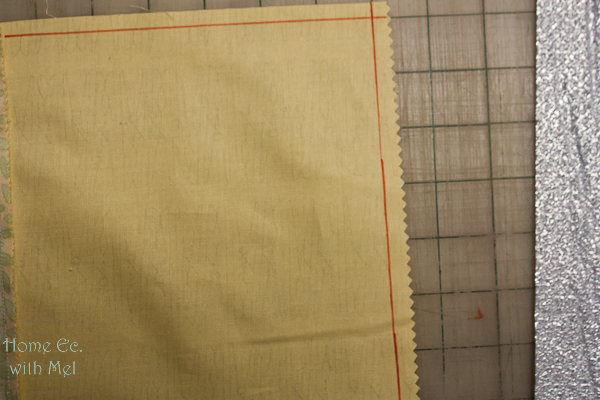 To do a French seam we turn the bag wrong side out and sew the seams just like we did before. I used a 5/8" seam to ensure all my raw edges were enclosed. For the zipper I used the 3x13 pieces. I folded each end down 1/4" twice to enclose the raw edges iron well, and then fold one of the long edges over about 3/8" and iron well. Do this to both of the pieces. The folded side will be where you sew the zipper. You want the fold right next to the zipper but you don't want the fabric to get caught in the zipper either. 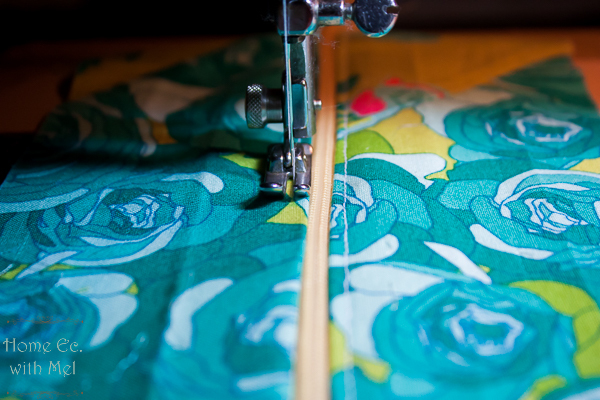 Center the fabric on your zipper and using either a zipper foot or a narrow foot to stitch the zipper to the fabric. To attach the zipper to the bag, wrong side of the zipper to the inside of the bag aligning raw edges. Stitch down with 1/4" seam, repeat on other side. Now this is where my bag will differ slightly from the pattern. I wanted to redo my straps but I didn't want to take all the binding off so my straps aren't under my binding. To make the straps take your 3x26 fold in half and press so you have a nice crease. 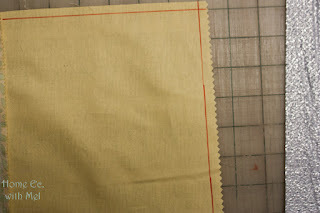 Open back up and fold the raw edge to the crease and press. Do this to the other side and then fold in half and press again. 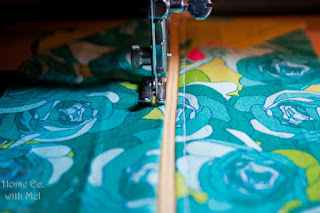 Now your raw edges are enclosed, stitch the opening close with a 1/4" seam. Do this to the other strap. Baste the handles to the bag, raw edge of the handles matched to the raw edge of the bag. I set my handles in about 2 inches from the edge. Bind the top of your bag enclosing all those raw edges. Now, we aren't done. I know binding is normally the end but we need to beef up our handles because groceries weigh a lot. So to do that we are going to use some things we don't normally use on our sewing machines. I got out my Kenmore 10 which is a free arm machine and it has the triple stitch. I used the free arm so I could get the bag under the pressure foot. This is the tricky part, you don't want to catch the zipper flap when you triple stitch the handles. Unsewing a triple stitch is a pain, don't ask how I know. With the handles hanging down, about 1 1/2" down put a triple stitch in left to right. Repeat this on all the handles. Then fold the handle up like you hold the handles when you carry the bag and put another triple stitch on the binding. This will keep the handles from coming off of your bag. I hope you all make some of these bags. Don't forget to pin the image below so you can come back and make these for the holiday season. It looks lovely and sturdy too. My grocery bags are always falling apart!